What’s happening here is that we’re booting up a KVM guest with 500 MB of memory, booting the Linux kernel, booting a minimal userspace, then shutting the whole lot down. And then doing that in parallel with 1, 2, .. 20 threads. The test fails at 21 threads because there isn’t enough free memory, so each qemu instance is allocating around 660 MB of RAM. This is wrong: It failed because libvirt out of the box limits the maximum number of clients to 20. See next part in this series. 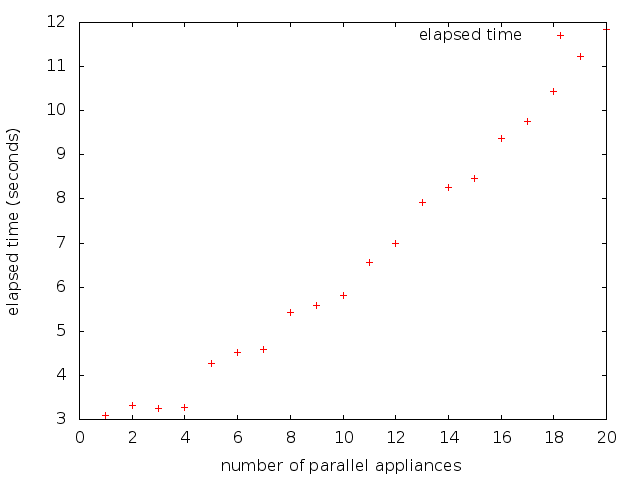 Up to 4 parallel launches, you can clearly see the effect of better utilization of the parallelism of the CPU — the total elapsed time hardly moves, even though we’re doing up to 4 times more work. # Get everything into cache. # Test increasing numbers of threads until it fails. die "launch failed with nr_threads = $nr_threads: $err"